How to create a beautiful and functional sock package design for Keny? Get to know the story of this packaging design that was awarded the ABRE design and packaging premium. Known for their comfort and quality, Keny´s socks are made in São Bernardo do Campo, São Paulo state. We were requested to give the brand un update. Later, we developed packaging design for all their line of products. We did research on fittings suppliers for hooks and designed structural and graphic projects for each product. We created 25 diferent dies for a family of more than 40 stock keeping units (SKUs). Each sock type has its characteristics presented in an image of a foot wearing shoes appropriate for the sock, as well as a patterns and colors differentiating the product. 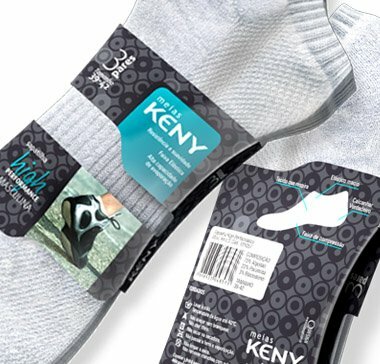 Socks packaging design for Keny was created with attention to functionality. We wanted consumers to view the product easily, ensure its integrity and allow easy display in points of sale . Moreover, the layout received subtle graphics in suitable colors for each consumer profile adding value to the product and the brand. The line was standardized and got more impact on points of sale, increasing visibility and sales.